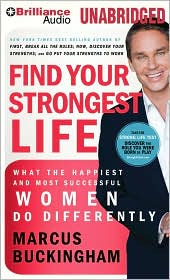 In “Find Your Strongest Life: What the Happiest and Most Successful Women Do Differently” Marcus Buckingham attempts to teach women how to have content and strong lives. He does this by interviewing a number of women, some are successful and happy, others are not. He then tries to determine what makes the difference. I’m into reading stories right now, so to read a self-help book was hard, I had to force myself to get through it. Some of the women’s stories were interesting and I gained some insights from them. But I had a hard time staying focused on his analog about the stories. At the end of each chapter, Marcus has a few “points to take away from this chapter.” Those were the best part of the book.